The Nationals – that exciting time when, for once, we know which anthem they’ll be playing during the medal ceremony. Let’s get to the lineup. Inoue & Baldwin stay in their love nest. Mary Beth Marley & Rockne Brubaker take a little trip together. Caydee Denney & Jeremy Barrett make up and step out. Amanda Evora & Mark Ladwig engage the competition. Caitlin Yankowskas & John Coughlin win it. Meryl Davis & Charlie White take a cue from Evan. Maia Shibutani & Alex Shibutani gross Tori out. The Matchup of the Madisons! Madison Chock & Greg Zuerlein give Tori the creeps and Madison Hubbell & Keiffer Hubbell get their Weir on. Caroline Zhang finds the pearl. Ashley Wagner comes up short in the short. Christina Gao gets up close and personal with NBC. Bob the Mailman picks Agnes Zawadzki. Mirai Nagasu pushes Frank Carroll’s buttons. Rachael Flatt flails. Alissa Czisny does a bear of an interview. Keegan Messing makes us very angry. Brandon Mroz, he was there, right? Armin Mahbanoozadeh is all right. Adam Rippon doesn’t get the coverage we need. Jeremy Abbott forgets to be a champion. Ross Miner will always have Paris. Richard Dornbush skates an elementary program. Ryan Bradley, our boyfriend. Evan Lysacek loves his applesauce! Plus, Sarah Meier, Carolina Kostner, Kiira Korpi, Florent Amodio, Nathalie Péchalat & Fabian Bourzat, and Aliona Savchenko & Robin Szolkowy show us the economy isn’t the only thing that’s weak in Europe. The good bit is at 6:37. This entry was posted in Events, Podcast on 2011-02-03 by epicdeer. Freakatron!!! The scary thing is that his outfit isn’t any worse than what we see in actual competition. Almost makes you wish he’d win a medal at the Olympics so the ISU and Olympic committee can crap their pants when he does the exhibition. 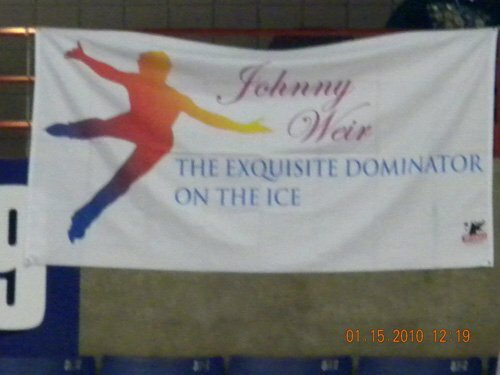 This entry was posted in Events, Tori's Tantrums and tagged Johnny Weir on 2010-01-31 by epicdeer. This entry was posted in Events on 2010-01-11 by epicdeer.